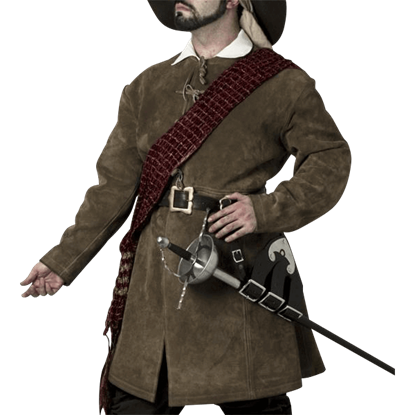 The 17th Century Buff Coat makes the perfect option for warriors re-enacting the Golden Age, Thirty Years War, or the English Civil War. Often worn beneath armour, historical buff coats were typically donned by cavalry and officers. 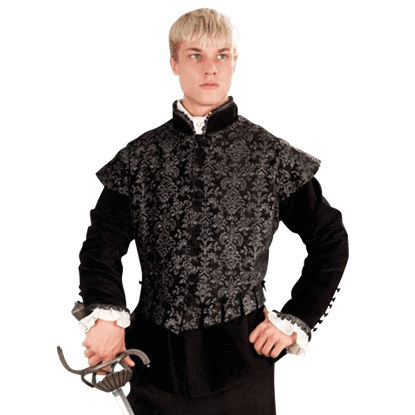 Also called a buff jerkin, the historical buff coat was developed from leather jerkins worn by soldiers during the Tudor era. 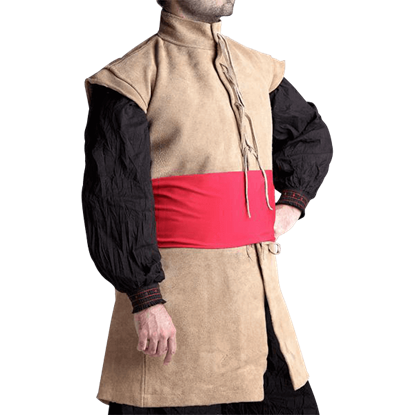 The 17th Century Sleeveless Buff Coat makes a great option for LARP events and historical re-enactments. 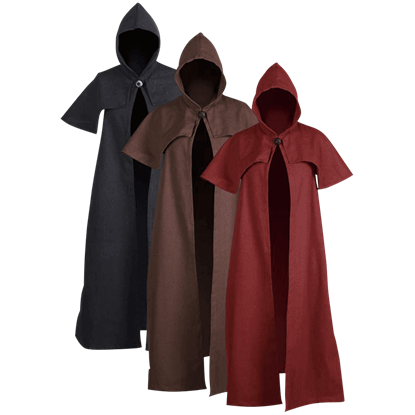 An excellent addition to any Renaissance outfit, the Abraxas Duster Coat is great for wearing over robes and other historic garb. Fastened at the neck with a single button, this coat features a hood and a stylish shoulder cape. An admiral is a person of authority, on sea as well as on land. His fashion should complement the power and responsibility of his position. 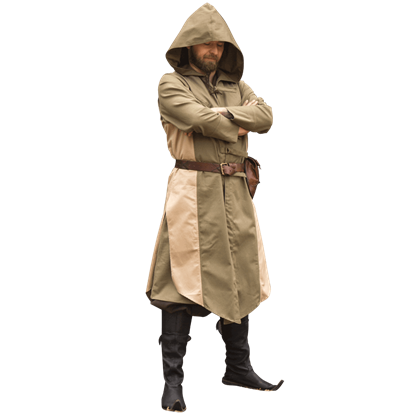 The Admiral Norrington Coat has been designed to ensure a commanding presence. 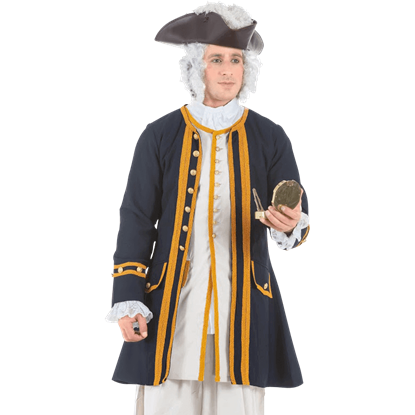 A historical admirals outfit is incomplete without his naval officers coat and vest. The Admiral Norrington Vest serves as an essential piece of an admirals wardrobe and has been designed to ensure a commanding presence aboard ship. In the Admiral to Admire Shrug, you will have an elegant accessory that can be draped over your shoulders and worn like a small jacket, all while adding a touch of style and beauty to virtually any look or ensemble you can imagine. 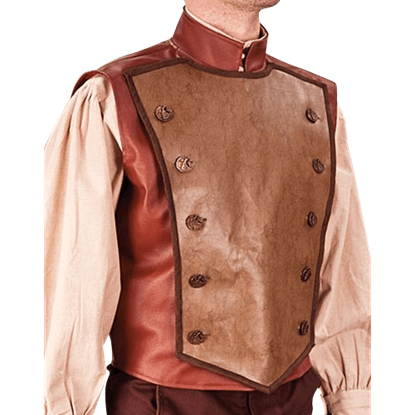 This Airship Flying Vest is made of faux leather that has a two-tone color scheme. The vest has a zip-up front, high Nehru collar, and a stylish bib front. The bib is held in place by ten antique brass clockwork buttons. To add a touch of dark decadence to any look, choose the Alana Sleeveless Velvet Bolero. 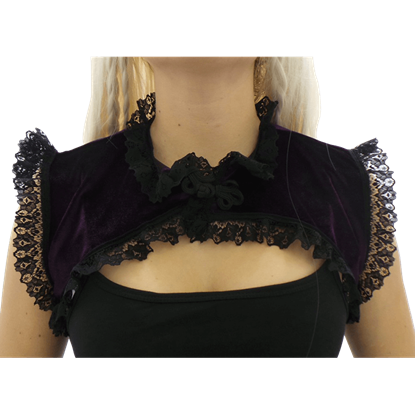 This elegant, Victorian-inspired bolero has ornate, black ruffled lace along each edge and secures at the neck with a frog and loop fastener. As you infiltrate the city, you pass by the guards unnoticed in your Altair Assassins Long Vest. You find your target as he enters his hideout, flanked by henchmen. Only a fool would walk in the front door, but someone left a window open. 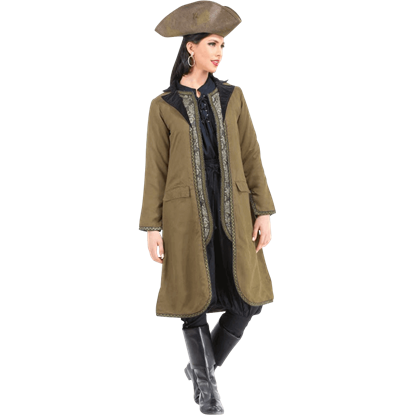 Finish off your wealthy pirate captain ensemble with a beautiful outerwear option like the Angelica Brocade Privateer Coat. This pirate coat features an intricate floral brocade pattern in black and shades of red-violet. 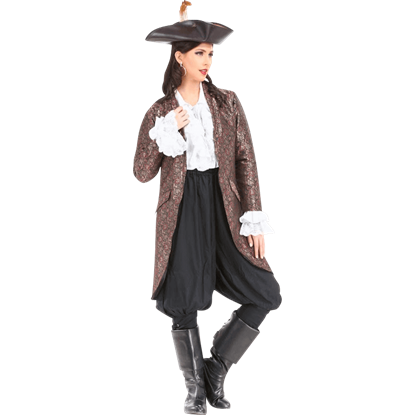 Prepare to command the high seas whenever you are spotted in this excellent womens pirate coat. The Angelica Suede Privateer Coat features brocade vest sections on each side of its front and intricate lace running along the edges. Versatility is the name of the game when it comes to this elegant vest. 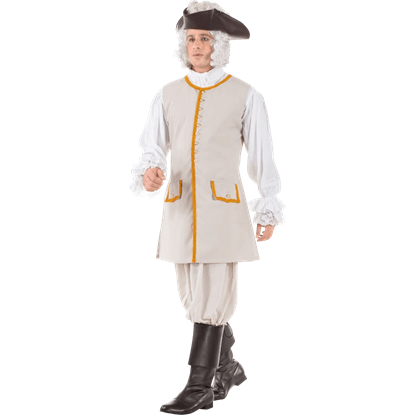 After all, the Aramis Doublet features a look, a cut, and a style that fits perfectly into just about any time frame, allowing anyone to look regal and dashing. Wow! Boots arrived days ahead of promised delivery and within needed time frame, and they're as awesome as I had hope they'd be! Needless to say I'll be singing your praises when someone asks me where I got these. You guys rock!